Alzheimer's disease was named after Dr. Alois Alzheimer (1864-1915) in 1906 who described two important microscopic findings: neuritic plaques and neurofibrillary tangles in the brain of a 55-year old female, who died from dementia. These two lesions are characteristic but not pathognomonic of the disease. Alzheimer’s disease is the most common form of dementia in the Western countries. The origin of the disease is still unclear although it has been demonstrated that ageing in the major risk factor. The management of this neurologic disorder is frustrating since, until now, no specific and curative treatment has been found, and so far, the only possibility to fight against the disease is to try to improve as much as possible the symptoms and the neurologic effects of the disease. Bentham e-Book Editorial had the courtesy to offer to our research group, the invitation to write and update of the Alzheimer’s disease. Nine specialized neurologists and general physicians whose expertise are based on dementia and old people diseases have participated in this interesting and exciting project. 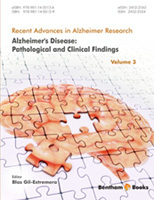 This book has nine chapters covering different aspects of the disease such as amyloid hypothesis, symptoms, pain, dysphagia, neuroimaging, brain connectivity, treatment, nutrition and palliative care. I believe that this book can be of great interest for students, physicians, internists, and even for patients, and their families. Finally, I would like to thank all the authors in this book, also Esperanza Velasco Rodríguez for the preparation of the manuscripts, and the Bentham Publishing Editorial that gave us this valuable opportunity.